for all your secure document and materials destruction needs. The Shredding Company, Inc., is a privately held, local business. We provide certified, confidential destruction of electronic and printed materials.Additional destruction services include products, components and textiles, with a mission and goal to assure confidentiality, security and protection for our customers. The Shredding Company, Inc., operates a fleet of secure, closed-circuit video and GPS-monitored mobile destruction vehicles, capable of destroying overup to 7,000 pounds per hour. We meet the needs of our customers by offering on-site and off-site shredding and destruction services. Certificates of Destruction are immediately issued upon the completion of each service,providing a guarantee that obsolete material was destroyed completely and efficiently. • We offer service one-time or on a continuous, regular basis, depending on your needs. • Our pricing model is fixed and all-inclusive. You will never incur additional charges for stop fees, fuel, etc. • Our security technicians are full-time certified destructions specialists, and required to undergo security clearances, seven-year background checks, drug testing, fingerprinting and rigorous security training. • We recycle the materials we destroy! • We are insured, carrying $2,000,000 in general liability; $1,000,000 in automotive; $1,000,000 in professional liability, errors and omissions; and $1,000,000 third party bond for all employees. 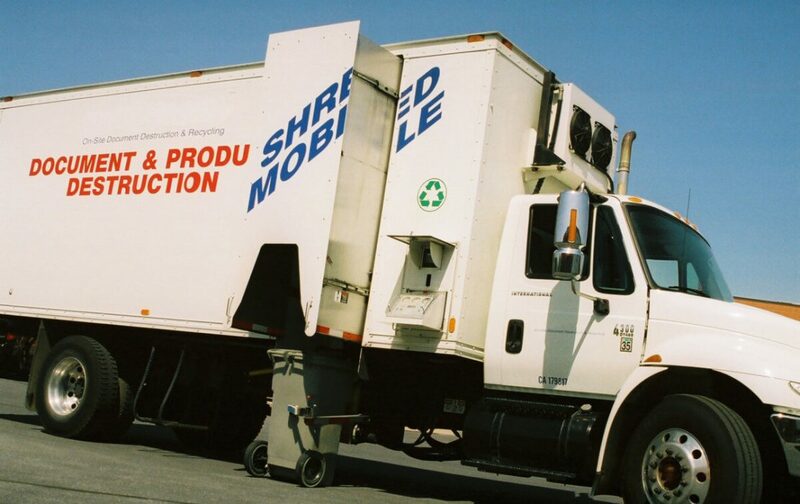 The Shredding Company, Inc., was founded in 2005 with a vision and commitment to handling the material destruction process the right way: efficiently and ethically, with customer service being a top priority. We commit to our customers that we will provide service that is reliable and secure. We also take pride in the fact that we truly value the relationships we have with our customers. Taking your calls, answering your questions and providing solutions is what we do well. We want to work one-on-one with each customer to assure all needs are met and expectations exceeded. Our team is available 24 hours per day, seven days per week, and works in accordance with and is certified by the National Association for Information Destruction. We are fully bonded and insured, a certified Small Business Reserve (SBR), Central Contractor Registered (CCR) and a GSA Approved Federal Contractor (GS03F20023V). We provide businesses compliance with: the Fair and Accurate Credit Transactions Act (FACTA), Health Insurance Portability and Accountability Act (HIPAA), the Gramm-Leach-Bliley Act (GLBA), the Sarbanes-Oxley Act (SOX), the Payment Card Industry (PCI) and many more.